From David Kirk, the bestselling author and illustrator of the Miss Spider and Little Miss Spider books. Nova the Robot is a precocious eight-year-old robot with a lot of heart and a penchant for space exploration. 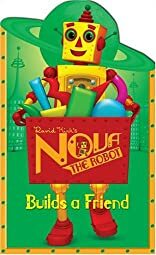 Get to know Nova and the robotic pets he has built as they learn how to hard-wire lasting friendships. Nova the Robot wants to build himself a friend, but he needs some help! This robot-shaped board book will have kids excited to learn their colors and shapes as they assist Nova in creating a pet.